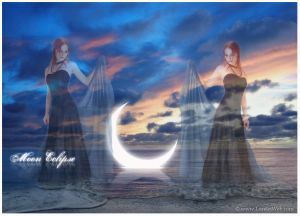 Fantasy Art for beginners – mysterious moonlit night written by Lorelei and moved over from www.loreleiweb.com for technical reasons. Believe it or not, but from a few ordinary photos and some primitive brushes, we will make this image (see below). OK, despite the rather impressive outcome, this is a very simple tutorial, you wont need more than a few brushes and a few pictures. Most of it is a mater of technique. Start by creating a new canvas, 500*500 pixels, and fill it with dark blue colour, we used #060062. Duplicate the woman’s picture, and set BOTH layers to “Luminosity” blending option. This will turn both layers blue, as we have a blue background. While the upper (duplicated) layer is selected, apply the Gaussian blur on it. Select the eraser tool with a soft edge, and go over the girl’s silhouette, erasing the blurred layer from over the woman’s body. This is how it will look, but work your way with the eraser over her skirt as well. really nice tutorial, really like the fantasy art, seems simple to reproduce! Thank you for doing this tutorial. I appreciate your time for doing these in easy steps, since i’m a beginner. The glow effect has really captured my attention and i’ll be doing this one as soon as I get some free time. I’m sure I will post it. thanks! hi thanks for the tutorial I sure learned a lot from it.. I am still trying to learn photoshop I only started using it last week so it might not be as good as the tutorial..
Hi everyone, I am new here and very new to photoshop. Only been using it for about a week. I did two pictures. The one you have here and one for my husband. I love this tutorial although I couldn’t get the lighting effect on the wolves, here are my pictures. This one I had some troubles with, not sure what happened but will definately try again. the lines between the 2 pictures are visible..
if you go to the right layer, you can erase those.. Thanks, Yeah I think I am addicted lol. I see the lines, I will fix that. Also, the bottom right hand corner is in black and white. I can’t figure out why it keeps turning out that color. Kmrogers, fantastic result! the one with the wolves is stunning! in my opinion, in both images u skipped the part where, BEFORE colorizing teh image u have to flatten the image… did u? that is the only explanation why some parts of your image are grey (in my image some parts were grey too, therefore i had to flatten and colorize). about the lines between the images – like providence said, take an eraser tool with soft round, preferably not too small, and go over the sharp edges to get rid of the dodgy parts. i love your results, for 1 week with photoshop its absolutely amazing!! Before I used a different picture with a white background, and when i put Luminosity and then guassian blur the picture became a bit black and not blue. What i did to get it working was copy the background you used in your tutorial and resized that and that worked. providence, u dont have to worry about the image been in some strange hue, it won’t be perfectly blue unless u fatten it and colorize, which is what we do in the end. Thanks Lorelei, I think I did flatten the image with the girl. I am going to start over though. I will post it as soon as I am done. this is a very nice tutorial. but why can’t i copy and paste the picture? thank for showing how to do this. It took me forever and alot of fustration, to finally get it, but it was worth it. Here’s what i made with your guidelines. This is a great tutorial, but for some reason I can’t get the lighting effect to work. It doesn’t show up on my layer. It tries to put it behind it and I am on the blurred layer. Any suggestions??? I am reatively new to working with photoshop besides just screwing around and I tried this out. I thought I would post it up for you all to see and give me advice on. I’m a newbie of photoshop and i hav some noob question. Can any1 here teach me? 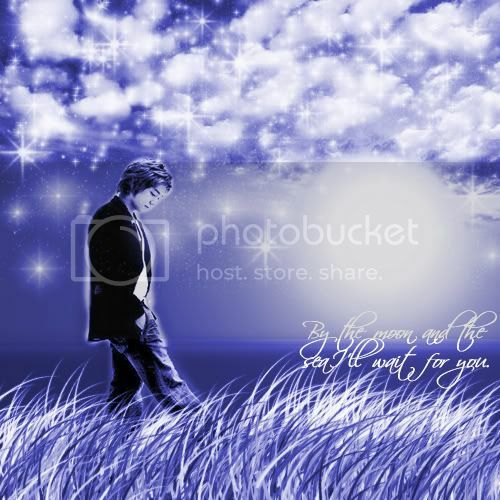 wad tool u use 2 draw the grass and stars?i downlaoded the star file but how to upload it? Brushes, then click the little button on the right that is a circle shape with a sort of “play” button image, go down to load brushes and find the brushes you downloaded. Ok this is a bit strange. I am trying to accomplish this tutorial, however, When I add a layer or and attept to perform things like render lighting I am unable to perform such tasks. They are grayed out on the menu bar. Can someone tell me what settings I would need to change which would make these other options available. I am using CS2 a bit different from PS 5.5 which is what I upgraded from. i am so frustrated! okay i got to the step where you erase the blur over the girl and it kept putting the background color over her, so it took me forever but i finally hit “erase to history” and it worked fine. so i do that, copy and paste the clouds, luminosity that, now i am stuck again where you use to eraser tool to erase the clouds from the girl and moon. the “erase to history button” which i had used before is gray and unclickable so now it is doing the whole background on the image thing again. how can i make it transparent? i am a photoshop n00b but i really want to learn. Sorry I couldn’t reply I was out of the country. Ok thank you to all who have trued to help with this problem. I may not have stated this clearly in my first post but I am unable to apply a Filter>Render>Lighting Efect while using the 16 bit color mode. It is only available using 8 Bit. Is there a fix for this? I don’t know how to attach file here so I can’t show a screen shot of what I see. this was an awesome tutorial, as I am new to this (very new) I had somewhat of a success, I just couldnt figure out how to get rid of the lines when I combined the two photos, I tried the eraser with different ranges and they all still came out wierd. I tried smudge tool and all but, overall very good and it is what i needed to get me going in the right direction. I wasnt even thinking of joining the forum since I got this site off of good-tutorials, but I just had to give you guys a big thank you. Now That I see your site and see how you have detailed explanations for us true newbies I think I will stick around and learn and hopefully eventually help. Voici mon résultat (je début dixième mini créa seulement, excusez mon inexpérience). I’m so annoyed that I can’t get this to work! I am not able to erase any of the blur. What am I doing wrong???!!! I think this is a wonderful tutorial…but i can not understand even i try and try…why “newbies” is included in the title…i mean if this is for newbies..then Why newbies find many dificulties in doing something so “easy”…becoming so difficult..for them?? ?